Road trips are about as American as apple pie, baseball, and bald eagles. They also give you a unique chance to enjoy the local culture of each state. Who hasn’t enjoyed a steaming cup of Tim Horton’s coffee while cruising through New York? Or a plate of crispy fried pickles in Georgia? The road is also full of ample opportunities to check out the weirder side of Americana. You’d be nuts not to pull over and check out these national treasures. 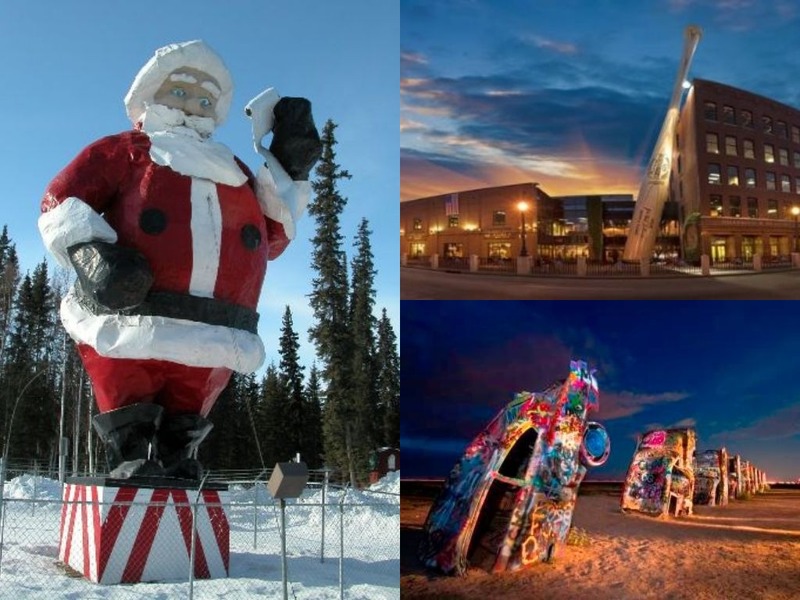 Let’s start off with the coldest and largest state… and largest Santa. If you find yourself checking out Alaska’s gorgeous landscape, you’d be a fool to not say hello to Saint Nick. While Alaska’s North Pole isn’t technically the real thing, it’s close enough. Straddling the Arctic Circle, North Pole, Alaska has some serious snow cred. Their Santa Claus statue is the largest of its kind, weighing in at a hefty 900 pounds. Better lay off those cookies, Mr. Claus! Forget the World’s Biggest Ball of Twine (sorry Kansas)! The World’s Largest Ball of Stamps is just that; a massive orb constructed of 4,655,00 stamps. It’s colorful, oddly beautiful and weighs in at a massive 600 pounds. Visit, take some snaps, and get ready to be inspired to set some new #stampgoals. You can’t miss this one. Truly a sight to behold, the Cadillac Ranch in Texas is an artful display of brightly colored Cadillacs half-buried upside down. These 10 cars aren’t there for any particular rhyme or reason, which makes this attraction all the more compelling! It’s as kitschy as it is clever: Foamhenge is an identical replica of Stonehenge made out of, you guessed it, foam! Apparently, the artist took great pains to make sure this small homage is exactly the same as the original. The name doesn’t lie: This is a truly a palace made of corn and corn products. Definitely unique in the world, this South Dakota tribute to all things corn has dazzled visitors since it was built over a century ago. Visitors can learn all about corn and see some fabulous corn-inspired artwork. This one isn’t technically a roadside attraction, as it’s located in the city of Louisville, but it’s still well worth the mention. A defining feature of the Louisville Slugger Museum, the World’s Largest Baseball Bat is designed to look like the trademark bat of Babe Ruth, one of baseball’s greats. It’s a castle made out of beer cans. Need we say more? The chateau is an homage to brew and supposedly houses Jesus, according to its builder. While there isn’t concrete evidence of a resident deity, this architectural wonder is one that you should not miss! Dog lovers won’t want to miss this stop on the search of oddities. It’s not an actual beagle, of course, but a dog statue that’s been converted into a bed and breakfast. There is only one room inside the statue, making this roadside attraction a great place to spend the night if you’re into one-of-a-kind lodging. Driving through rural Georgia, you’ll find a giant peanut with teeth, meant to honor former President Jimmy Carter. (Jimmy Carter was famously a peanut farmer prior to becoming president, so the statue is fairly fitting.) Make sure you stop by this one and say hello to old Jimmy. This house is made entirely of paper, except for its roof and floors, and was started in 1922 as an experiment in insulation that turned into a challenge for builder Ellis Stenman. You’ll be amazed by what he was able to do with the interior of his residence. The Paper House is not to be missed. Go see a big brick made up of many small bricks… We’re serious. This brick is in a hotly contested battle with another brick out of Texas but has just managed to hold onto its title. Why not pull over and snap a few pics of yourself in front of this mammoth brick? It’s a roadside attraction in true American fashion; making giant replicas of things that exist and showcasing them on the side of the road. You’re unlikely to make Hawaii part of your road trip for logistical reasons, specifically that it’s in the middle of the Pacific, but we couldn’t skip this attraction. Alaska’s outlying sister to the south boasts the World’s Most Scenic Urinal at their Hotel Kona. You can relieve yourself while taking in a stunning tropical view! The last one on our list is definitely the weirdest, especially considering the guy in question is still alive. Nicholas Cage, who apparently likes to plan ahead, has picked out his mausoleum already and you can visit it today. It’s a pyramid that says “Omnia Ab Uno” meaning “Everything From One.” Interesting… and macabre!